For presidents, many brewing crises can be smoothed over by diplomacy and bargaining, but Mother Nature makes no deals. With forecasts predicting that the Northeast will experience some near snowpocalypse-level weather, Donald Trump is prepping for what could be his first major snow crisis. (Original Caption) Youngsters frolicking through the snow in Central Park as New York's skyscrapers in the background form this picture postcard setting during today's snowstorm. The East Coast from Northern Virginia to Boston is cowering under the winter's worst snowstorm, lashed out of the skies with stinging 35MPH winds. The blizzard is expected to leave New York in the afternoon with an accumulation of 8 to 10 inches in its wake. Children sledding on a snow covered path in Central Park, New York City, ca. 1900. (Original Caption) This is a general view of the southwest entrance of Central Park after New York was greeted with its first December snow. Pigeons in foreground seem to take the weather change is stride. A six-inch fall was predicted. If the coming storm, which is expected to hit late Monday and continue into Tuesday, is as bad as meteorologist say it could be, federal assistance may be needed. As such, it's up to Trump to ensure that emergency divisions, like FEMA, are ready to help. 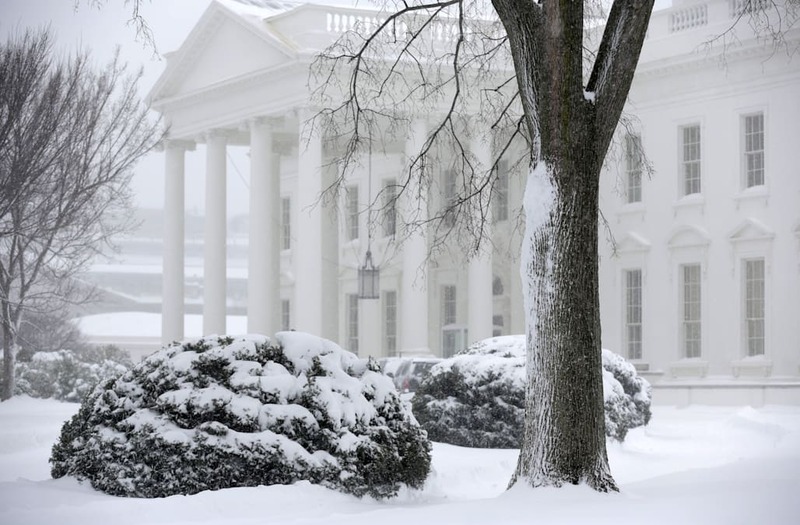 Many are wondering how Trump will manage his first major snow storm, after his predecessor, former President Barack Obama, famously mishandled his first winter storm, upsetting residents of Washington, D.C. shortly after taking office. SEE ALSO: Bombogenesis: Could Winter Storm Stella become a weather 'bomb'? As POLITICO points out, mere days after he was inaugurated in 2009 Obama commented on his daughter's school closing. "Because of what? Some ice?" Obama said. "We're going to have to apply some flinty Chicago toughness to this town." Thus far, the president appears up to the task, holding meetings with heads of departments that will be key in mobilizing support. Trump has voiced hope that the storm will not be as severe as predicted, but also noted, "FEMA and the federal government are ready to assist. They are literally waiting by the phones and ready to go." Regardless of how the weather turns out, one important event has already been impacted. CNN reports that Trump's meeting with German Chancellor Angela Merkel, originally scheduled for Tuesday, has been pushed back to Friday.